Table Top Hot Bain Marie Manufacturer/Supplier/Exporter in Delhi, Table Top Hot Bain Marie in Delhi. 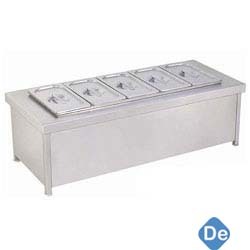 Having a definite quality management system, we have been able to provide an exclusive range of Hot Bain Marie Table Top. The provided range is fabricated by utilizing superior quality materials that are procured from the genuine vendors of the market. Moreover, our skilled professionals also ensure that these products are made in compliance with predefined global quality guidelines. Our customers can avail these products from us at economical rates.